Disclaimer: there is nothing, I repeat NOTHING, healthy about this recipe. So don’t expect me to spring out some kind of applesauce-for-butter swap or reduced-fat chocolate chips or something. First of all, that would be silly. When you make Texas sheet cake anything, you go all in. Second of all, these are for my brother-in-law, Billy, who is a college student at Vanderbilt. I do not think he would appreciate these swaps as much as you and I might. That said, these babies are mightttttty rich, just the way that Texas Sheet Cake should be. The first time I ever heard of this dessert was actually at my husband’s family’s house in Pittsburgh. Billy apparently loves this cake, and my now-mother-in-law made it for him (she’s always making up these fancy desserts for her boys- I don’t know how she finds the time to do it!). Basically it is cooked in one layer (hence the “sheet” cake part) and drizzled with this decadently sweet, gooey chocolate homemade icing. Another visit (I think it was Easter?) I saw this recipe again, but this time in cupcake form! I think I even blogged about it! Yep- confirmed. That post is here. Note the Easter-appropriate toothpick bunny flags. Love. Easter is the BEST. Since I’ve tried these in sheet cake form and cupcake form, the only remaining way to try them (besides over my yogurt or oatmeal, of course) is in cookie form! 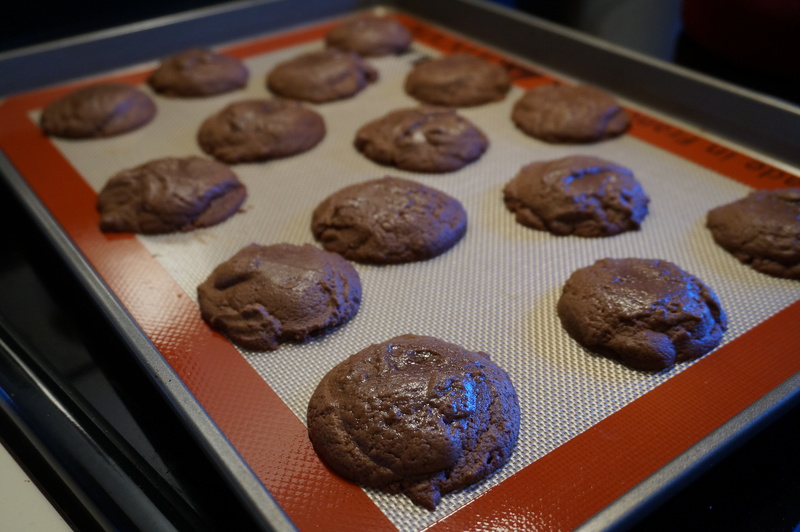 It sounded like a great idea, especially when I found confirmation on Cookies and Cups blog! Score. I instantly knew what to send the birthday boy. I was also excited to use my new Silpat, which I got on Amazon. I’ve been seeing this used on a lot of my favorite baking blogs, and I’ve been told that literally nothing will stick to it. As someone who goes through cooking spray like it’s nobody’s business, I jumped on the opportunity to purchase a Silpat. Who wants all those chemicals and who-knows-what-else from that stuff in their body? No, Siree! (Billy could probably care less. But I do it out of love. One day he will thank me when he doesn’t have giant tumors growing out of his ears). Get ready to be blown away, and to have some very messy, chocolatey hands (please excuse my own in the close-ups!). I highly advise having a dog who doesn’t die when given endless amount of hardened chocolate icing, or a husband who doesn’t care as much about his figure as you care about yours. Aka, the human garbage disposal. 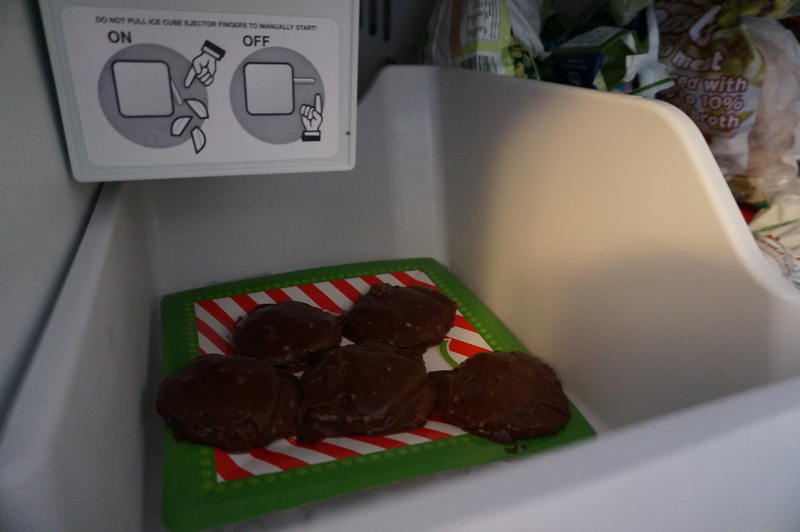 I actually had to stick these in the freezer (see pictures below) to allow the icing to cool enough to package them up to send! Made it to the post office on this Saturday with about 3 minutes before it closed. FTW! Your world is about to be rocked. Texas style. 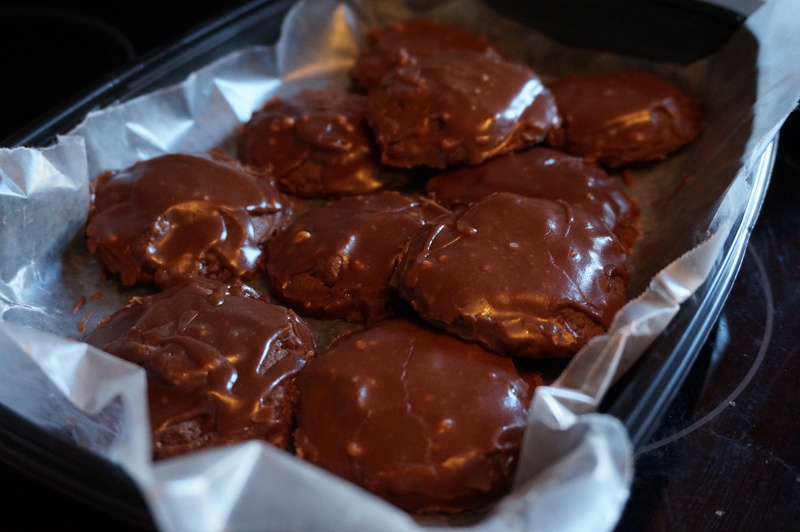 A decadent, fudgy treat for the chocolate lovers in your family. Enjoy with a nice big, cold glass of milk to wash it down! Makes 15-24 cookies, depending on size of cookies. In a stand mixer, beat together butter and sugar until smooth. Add egg and vanilla and continue to mix on low. Add baking powder and salt. Add flour gradually. Dough should get thick. 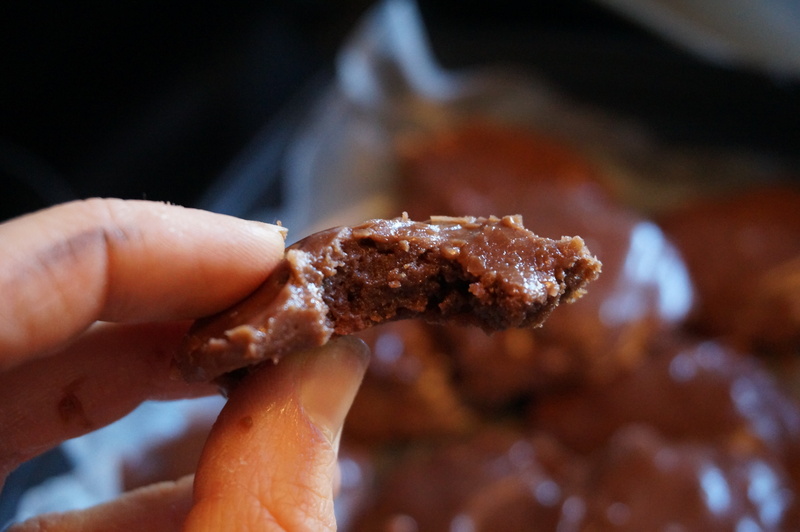 Melt chocolate chips by placing in a microwave-safe bowl and cooking in 30 second increments, stirring in between. 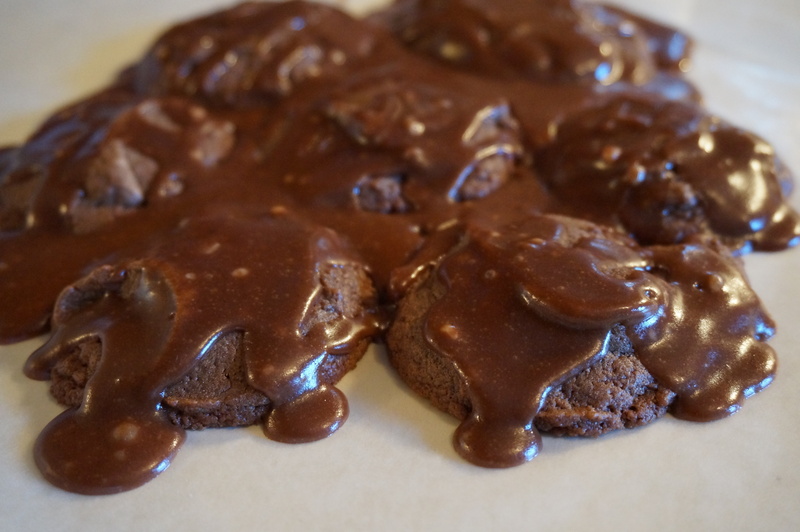 Stir melted chocolate straight into the cookie dough. Chill for 10 minutes to allow dough to set a bit. 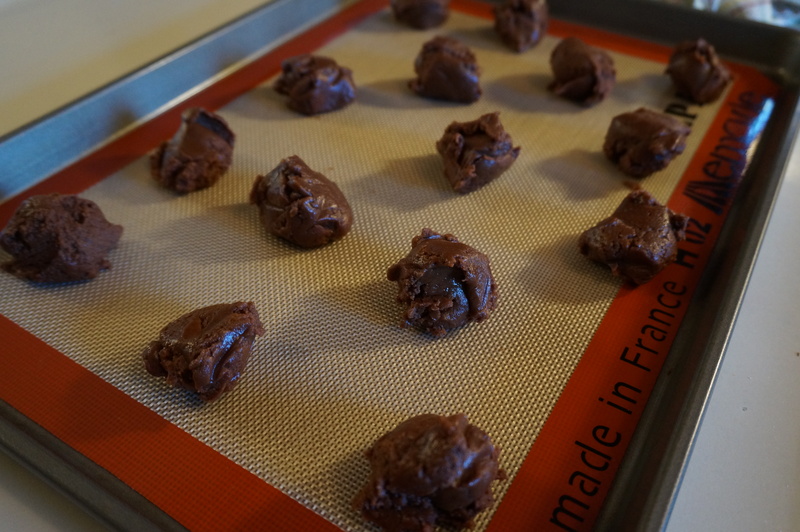 Scoop up rounded tablespoonfuls of dough onto a Silpat-lined (or lightly oiled) cookie sheet about 1 inch apart. Bake 5-7 minutes, until tops of cookies are just set. DO NOT overbake these! They will still be very soft when they are done! 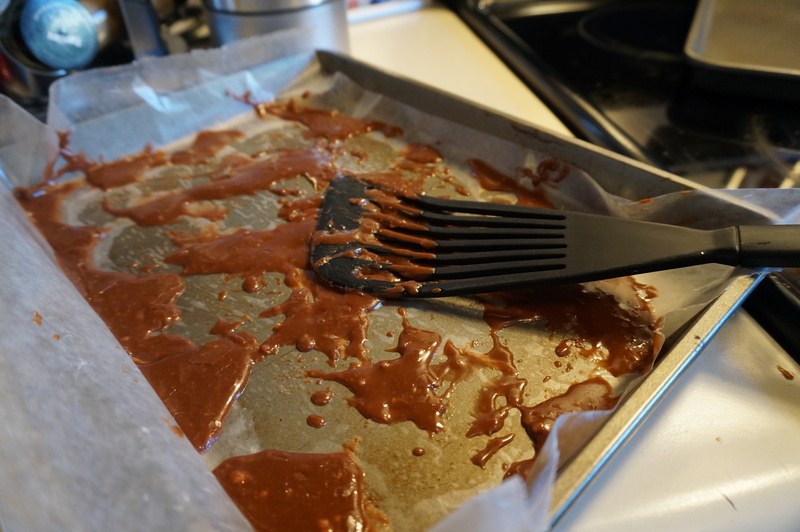 Wait a few minutes before transferring to a wax-paper lined baking sheet. Arrange cookies so that they are almost touching each other. For the icing, heat one stick butter, cocoa powder, and milk in a saucepan on medium heat. Whisk together until smooth. Whisk in the powdered sugar gradually.